Whitney West Swinford scored 12 points against UTEP. The craziness of March Madness – the frantic, frustrating and often fabulous time of postseason collegiate basketball – is upon us, and Abilene Christian University earned a taste of it earlier this week. Three men’s and four women’s teams from the Southland Conference qualified for this month’s national postseason tournaments, including ACU. Southland Conference MVP Alexis Mason scored 11 points against the Miners. Stephen F. Austin State University made the most noise, stunning No. 3 seed West Virginia University 70-56 yesterday in the first round of the NCAA men’s East Regional. The No. 14-seeded Lumberjacks, who have won three straight league titles while forging a 53-1 Southland regular-season record, play the University of Notre Dame on Sunday afternoon (1:40 p.m. CST on CBS). The Wildcats of head coach Julie Goodenough played a heroic game Thursday night in the first round of the Women’s National Invitational Tournament, dropping a 66-62 heartbreaker to The University of Texas at El Paso in front of 4,517 noisy fans in Don Haskins Arena on the UTEP campus. ACU trailed by as many as nine points before making a 12-0 run in the fourth quarter that gave them a 52-49 lead with 5:18 to play. But the Miners bounced back in the last three minutes, hit seven of eight free throws down the stretch, and advanced to a second-round game tonight with Arkansas State University. 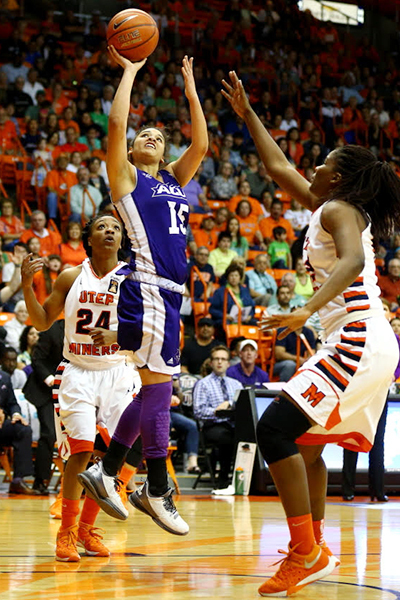 Neither ACU nor UTEP expected to face each other in the WNIT first round. 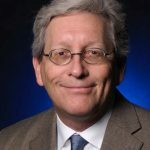 With a 26-4 record, the Miners were the highest-ranked women’s team to not make the NCAA Tournament, having won the Conference USA regular season but losing to Old Dominion University in the C-USA postseason semifinals. 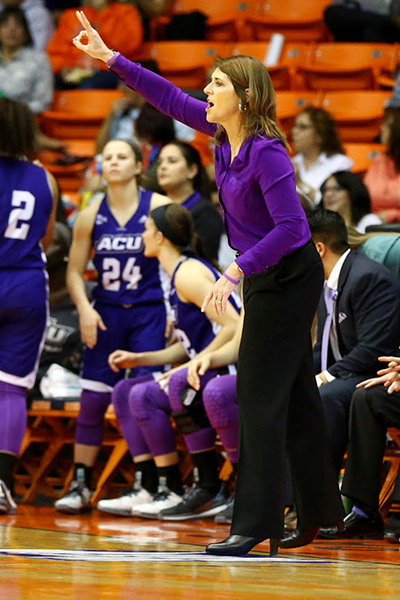 ACU head coach Julie Goodenough signed a four-year contract extension following the Wildcats’ stellar regular season. UTEP was ranked in the Associated Press Top 25 women’s poll most of the season. ACU won the Southland Conference regular season title but couldn’t participate in the postseason tourney. The WNIT quickly snatched up the Wildcats for its field of 64 teams. 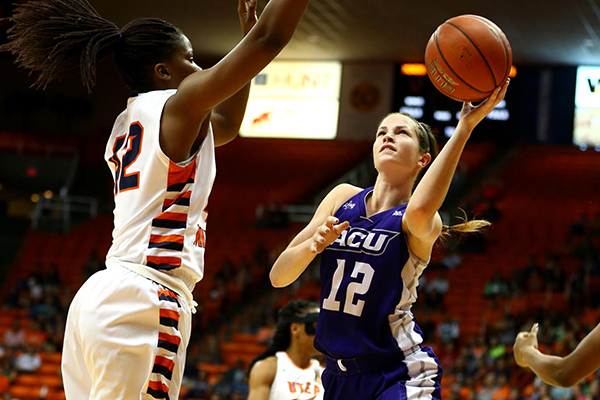 ACU owned the best record in the WNIT field; UTEP had the second best. In its game story, the El Paso Sun Times called ACU “superb” even in defeat, and it’s easy to see why. What the Wildcats did during the 2015-16 regular season – beating six teams playing last week in national postseason tournaments (University of Central Arkansas, McNeese State University, Northwestern State University, University of Idaho, Eastern Michigan University and Grand Canyon University) – is remarkable, given they are in their third year of a four-year transition to NCAA Division I, as are ACU’s other 15 athletics teams. Goodenough’s squad will be NCAA Tournament-eligible for the 2017-18 season, and by then will have a wealth of experience and additional talent on which to draw. The Wildcats lose just two seniors (Whitney West Swinford and Paris Webb) from the 2015-16 team, and for 2016-17 will return four top-drawer juniors in twins Suzy and Lizzy Dimba, Southland Player of the Year Alexis Mason and Sydney Shelstead. A talented group of freshmen will make the roster deeper as well: Dominique Golightly, Pam Herrera, Lexi Kirgan and Brea Wright.